Hi Everyone! Happy Monday! It's finalllly starting to feel like fall around here, and by that I mean it's in the lower 80's. (insert rolling eye emoji) But hey, I'll take it! If you have followed me for a few months you know that I LOVE personalized, delicate necklaces that can be layered. Don't get me wrong, I love a great statement necklace but 95% of the time, you will see me wearing necklaces like this. 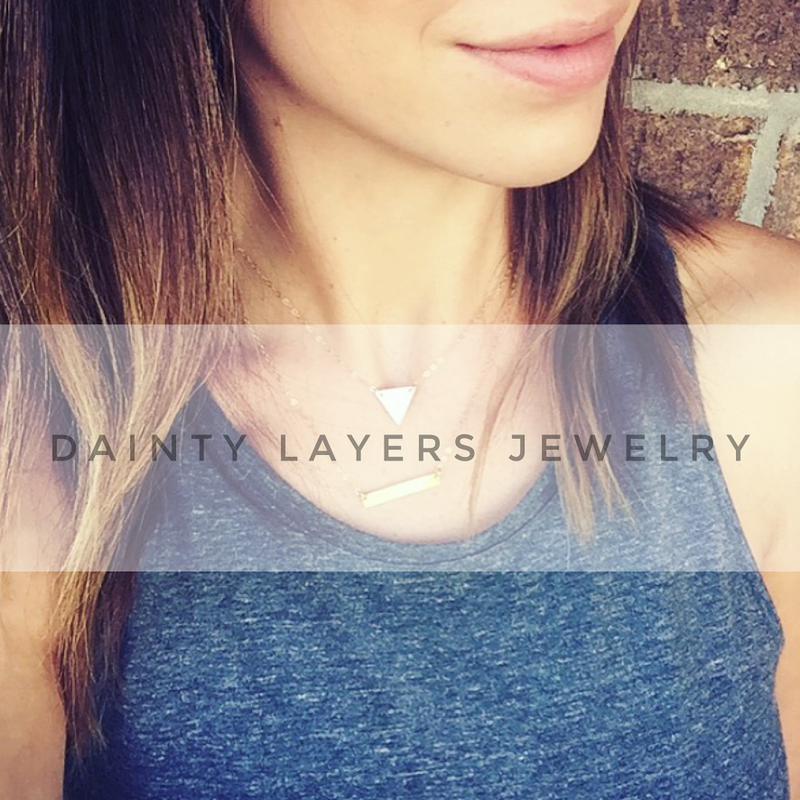 I received this necklace c/o Dainty Layers Jewelry and am wearing the Layered Triangle Necklace. This necklace definitely caught my eye because I have nothing like it. 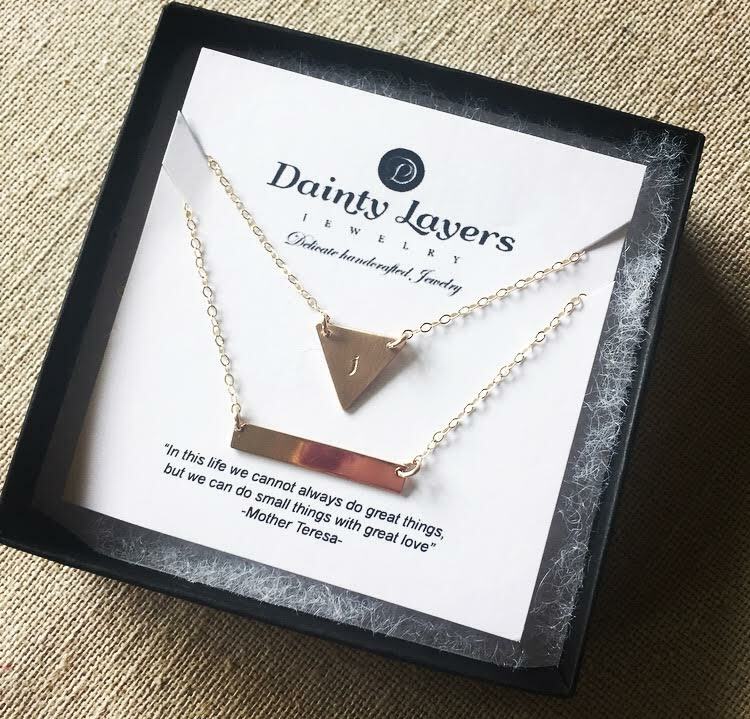 I love the uniqueness of the triangle necklace. 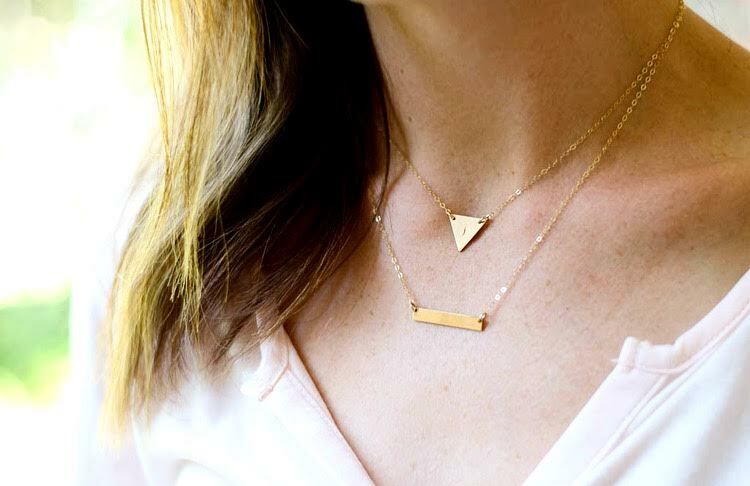 Anything can be personalized if you choose (I have a "j" stamped on the triangle) and you can choose different styles like gold filled, sterling silver or rose gold, and different lengths as well. 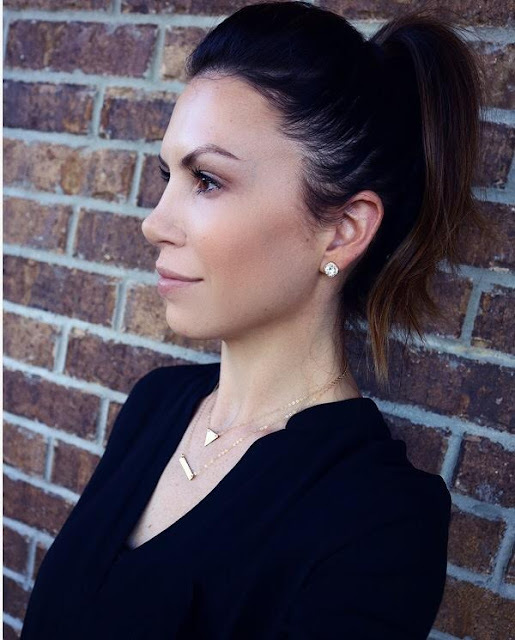 Another thing that makes this necklace super versatile and unique is they are separate necklaces so you can wear them together or by themselves or mixed with other pieces you already have. I already have my eye on THIS NECKLACE too and I think it would be so cute to get Londyn's date of birth stamped on THIS NECKLACE. Her packaging is so cute and personalized and I love the quote that came with the necklace. but we can do small things with great love." - Mother Teresa. I'm kind of a sucker for packaging and small details like that! Definitely give her shop a look at! I love giving personalized jewelry for gifts, so with Christmas coming up, I know I'll be making several purchases for friends and family! Would also be a great gift for bridesmaids! Here is all of her info so you can follow her on social media for specials, new items and discounts! 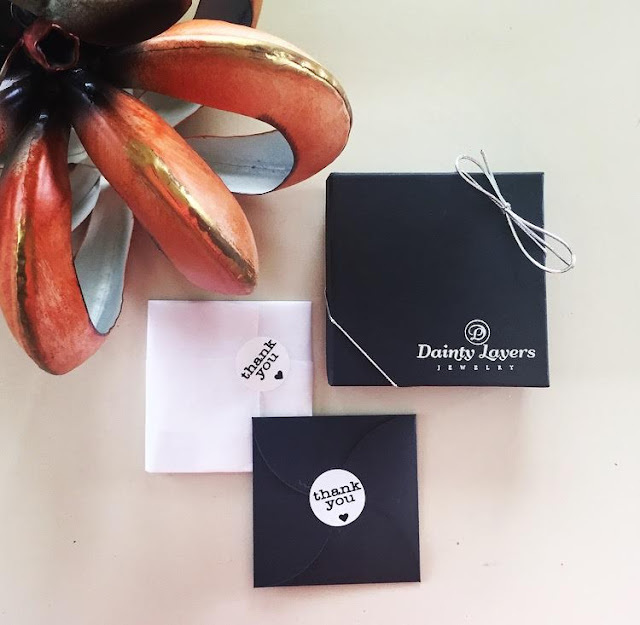 Thank you Dainty Layers Jewelry for sponsoring this post! I love those necklaces! Perfect for everyday! Thank you Nataly!I love the spelling of your name! Okay... these pieces are BEAUTIFUL! Love them. And, you look great in them. That necklace is so pretty! I love it. I've been eyeing the one you linked to on Etsy as well. Thank you, April! I want to get one of everything! I love all of her jewelry! 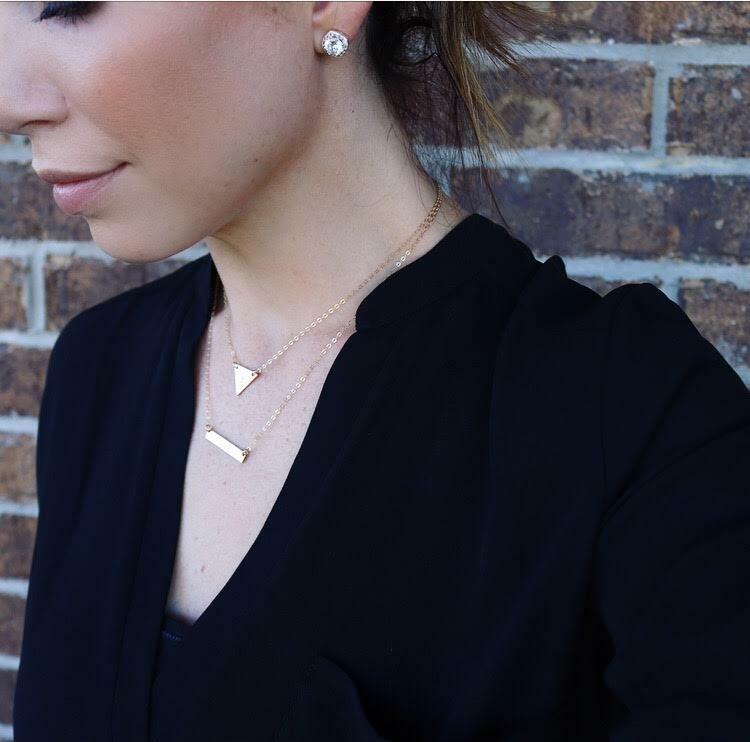 I love simply dainty gold jewelry. It's kind of my signature. Looks like your loving it too. I love your statement necklaces, though! Love from a Style Collective sister. You're welcome Jessica! Have a great day! Thanks for stopping by! i love dainty jewelry and these are perfect! you can totally wear them everyday which i love! 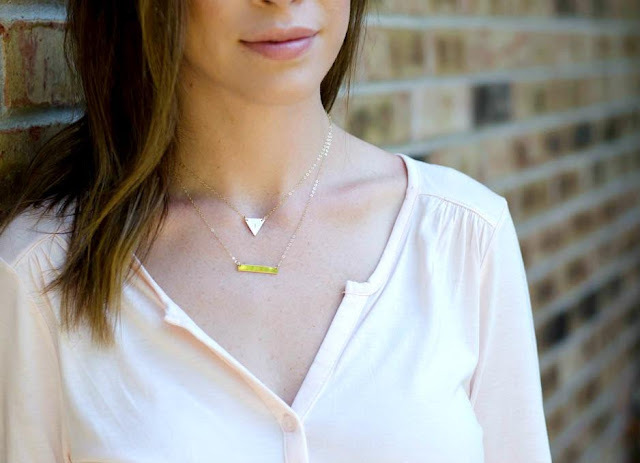 love simple and dainty jewelry! perfect for everyday wear! these are perfect! ME too, Stephani! Thank you! What a cute little necklace! Love how u styled it! Love dainty pieces! These are gorgeous! Thanks Jessica! Have a good one!